On week ending 6th April 1974, the top three UK singles that week were unique; at number three it was Emma by Hot Chocolate, number two was Billy Don’t Be A Hero by Paper Lace and at the top was Seasons In The Sun by Terry Jacks – all three were death discs. This week I focus in on the chart topper. When Terry hit the chart in March 1974 he was not a newcomer. His name first appeared in 1970 as a member of the Poppy Family which featured his then-wife Susan and their hit was Which Way you Goin’ Billy. When it was finally decided that they weren’t going to record it, Terry reclaimed his arrangement and did it himself and it topped the UK chart for four weeks. It was also brought to a new audience when Westlife took the song back to the top and was the last number one of the 1990s. Terry followed it with one further top 10 hit, another Jacques Brel song, this time one he’d written in 1959 and also translated into English by Rod McKeun, and that was If You Go Away, another sad song with great covers by both Dusty Springfield and Scott Walker. 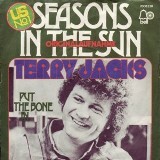 In Terry’s home country, Canada, Seasons In the Sun went to number one and sold nine million copies. Clearly a lot of loved it and probably for different reasons, but there was certainly one person didn’t; “It’s no secret that I didn’t like Terry Jacks’ version,” said Rod McKuen, “Because he changed some of my words.” I’m sure he didn’t complain when the royalty cheques started, and kept, rolling in!